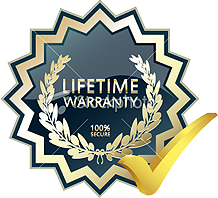 We Offer A Lifetime Warranty On Every Product We Sell! Every Elite Garage NE® floor coating we sell is backed by a lifetime warranty that guarantees that the coating won’t peel, chip, or discolor. Our Polyurea and Polyaspartic products consistently outperform other floor coatings on the market. Here in New England, where the weather is always changing – we deliver a product that is designed to meet the rigors of bitter cold winters and sweltering summer heat. Check out our successful installations all across New England. This Elite Garage NE® "Floor Coating Lifetime Warranty" is included in every contract we sell. Every Elite Garage NE® storage cabinet, ceiling rack and slat wall we sell is backed by a lifetime warranty that assures you of the highest possible quality and workmanship. We sell and install garage components that are designed specifically for stability, toughness, durability and of course great looks. This Elite Garage NE® "Garage Components Lifetime Warranty" is included in every contract we sell.